My three stars here are a compromise. Try as I did, I could not enjoy this novel, but it is marketed more toward New Yorkers than others, and although I like a good urban setting and have enjoyed New York, have friends and family from there, I don’t live there and never have. Also, the plot is oriented toward the art world—Marie and Simone are senior citizens studying art, and there are a lot of references to art that went right past me. So if you are a New Yorker interested in both the history of Manhattan and art history, then this might be your book. And thank you once more to Net Galley and Scribner for permitting me to access a galley in advance for the purposes of review. Some writers have a taut, urgent writing style that leaves their readers perched, sometimes literally, on the edges of their seats. Some have a sumptuous, painterly style that takes its time, and one should sink back into a soft place by the fire or in summer, perhaps on the beach, and prepare to drink it all in. Walbert uses the latter style, and I wanted to sink back, wanted to drink it all in, but for me, the description was the whole thing. I found myself bogged down with description that did not appear to serve much plot, and it never felt as if it was moving forward. There was a lot of inner dialogue, remembrance, but so very little actually seemed to happen. I have never found myself dissatisfied for this particular reason, and so I thought surely it must be me. I went back and started it over three times, and in the end, I came away frustrated. The over-long footnotes (in fiction?) were a distraction, and the style, in the end, felt pretentious. But then again, remember that I know almost nothing about art. I know of a couple dozen famous paintings, and I thought I would like this story because I loved The Goldfinch, whose most critical scene is set in an art museum. And maybe that was my own problem as well: trying to follow a Pulitzer winner like The Goldfinch is indeed a heavy burden. I came away from reading that book and Toni Morrison, so perhaps my expectations were a trifle high. But I can’t honestly say I liked this book. If you are a New Yorker, especially an older one, and if you lean toward the art world, you may enjoy this novel, by an award-winning writer. It has just been released, so if you would like to order it, you can do that now. 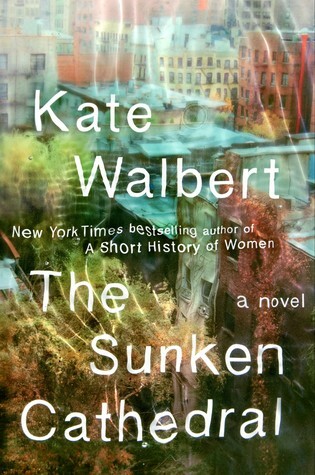 This entry was posted in historical fiction and tagged art in fiction, book blog, historical fiction, literary fiction, The Sunken Cathedral review by seattlebookmama. Bookmark the permalink.